Wow, it has been a long time since I posted to this blog! I’ve been busy putting my favorite blog posts into a book, which has recently been self-published. In 6-8 weeks, it should hit Amazon. 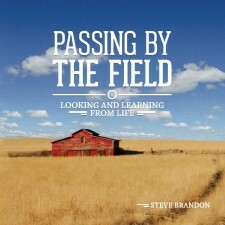 But, If you want to purchase a cheaper copy now, go to this link: http://www.lulu.com/shop/steve-brandon/passing-by-the-field/paperback/product-21541137.html. If you order by Thursday (4/10/2014) and use the code, FM303, you will get free shipping. That means $9.99, and you can have the book delivered to your door. So act fast. And your want like an armed man (Proverbs 24:30-34). to be insightful, informative, and inspirational. Also, I do intend to pick up my blog posting again. Not every day, but more often than once each year. See you all soon. 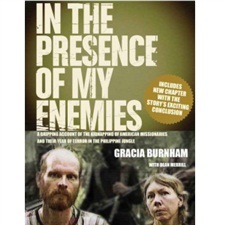 I just finished reading Gracia Burnham’s book, “In the Presence of My Enemies.” She and her husband, Martin, were New Tribes missionaries serving in the Philippines. The Burnhams were spending a much needed holiday away for their anniversary in May 2001. In the middle of the night, they were kidnapped by the Abu Sayyaf, a Muslim terrorist organization with connections to Al Qaida. They spent the next year as captives in the jungle, as their captors hoped to get a large ransom for their reward. The book tells the riveting story of the hardships of living on the run in the jungle with no bed or hot water or electricity or many of the basics of life. Furthermore, they were constantly lacking food and ducking for cover in the crossfire of many gun battles between the terrorists and Armed Forces of the Philippines. I really couldn’t put it down. The Burnhams are a great illustration of leaving all for the sake of Christ. They had left all behind to serve those in the Philippines. In their captivity, they were forced to leave all behind, including their three children. One of my favorite quotes is this: “I realized that when everything is stripped away from you and you have nothing, you find out what you really are down deep inside. What I was starting to see was not pretty.” That’s why we need Christ. John Bunyan pictured the struggle of the Christian life beautifully in his allegory, The Pilgrim’s Progress. When Christian set out on his journey, he encountered two people, Obstinate and Pliable, who sought to turn him back. Christian fell into the Slough of Despond. All along the way, there were many who sought to turn him from his way, among whom are Mr. Wordly Wiseman, Formalist and Hypocrisy, Talkative, Mr. By-ends, Mr. Money-love, Mr. Save-all, Demas, Ignorance, and Atheist. Christian battled Apollyon with sword and shield. Christian traveled through the Valley of the Shadow of Death. Christian faced the temptations of the city, Vanity Fair, where his companion, Faithful, was put to death, after a trial filled with many slanderous and false accusations. Christian had to walk by the dangerous hill called Lucre, which had a Silver-Mine, which ensnared Demas. Christian dodged the pit into which Vain-Confidence fell. Christian faced the mean, Giant Despair. In the end, Christian had to pass through the river of death, before finally reaching his journey, the Celestial City. When John Bunyan put pen and ink together to describe the Christian life, this is how he described it. But somewhere in our American Christianity, we have developed this notion that salvation is an easy thing, which will lead to an easy life, which is filled with nothing but blessing. I have heard many describe the Christian life as a very easy thing. 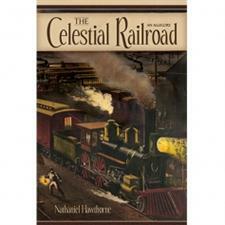 Last century, Nathaniel Hawthorne followed up Bunyan’s classic with an allegory of his own, entitled, “The Celestial Railroad.” In this short story, Hawthorne describes how he recently happened to travel to the City of Destruction. No longer to pilgrims need to walk arduously between the City of Destruction and the Celestial City, like in Bunyan’s day. Rather, there is now a railroad, which people can get on and travel to the same place that Bunyan’s pilgrims followed at high speed, with great ease and safety. On this train-ride, Hawthorne meets such fellow travelers as, Mr. Smooth-it-away, Mr. Live-for-the-world, Mr. Hide-sin-in-the-heart, Mr. Scaly-conscience, Mr. Take-it-easy, and Mr. Flimsy-faith. He meets the ministers, Rev. Mr. Shallow-deep, Rev. Mr. Stumble-at-Truth, Rev. Mr. Clog-the-spirit, and Rev. Dr. Wind-of-doctrine. He found out that the Rev. Mr. This-to-day was expected to resign his pulpit and the Rev. Mr. That-to-morrow was going to take it over. On this train-ride, he saw many of the same places that Christian had visited hundreds of years earlier, The Slough of Despond, The Valley of the Shadow of Death, and Vanity Fair, as the railcar whizzed past them all. He saw these sights from a distance without ever going through them. The idea of the story is to show that we in our day and age, don’t need to go through such difficult things as the Christians of olden days. Things are easier now, and there are other ways to the Celestial City, other than walking the path as Christian did. Mr. Great-heart, from Bunyan’s story, who was offered a prestigious job as a conductor on the train, turned it down, insisting that pilgrims travel the road on foot, considering it “a sin to travel in any other fashion.” Hawthorne tells of how those on the railroad ridiculed those few pilgrims that chose to take the hard journey on the narrow road to the Celestial City. “The passengers being all comfortably seated, … accomplishing a greater distance in ten minutes than Christian probably trudged over in a day. It was laughable while we glanced along, … to observe two dusty foot-travelers, in the old pilgrim-guise, with cockle-shell and staff, their mystic rolls of parchment in their hands, and their intolerable burdens on their backs.” Instead of a few pilgrims on the way (Christian and Faithful and Hopeful and Goodwill), there were now scores of people willing to take the easy road to the Celestial City in the luxury of a railroad car. As Hawthorne says, “Instead of a lonely and ragged man, with a huge burden on his back, plodding along sorrowfully on foot, while the whole city hooted after him, here were parties of the first gentry and most respectable people in the neighborhood, setting forth towards the Celestial City, as cheerfully as if the pilgrimage were merely a summer tour … [with their] enormous burdens … snugly deposited in the baggage-car” — out of sight, out of mind. What a difference between the two perspectives! They describe the differences very well. The character of Christianity in America has changed in our day, away from the Biblical perspective. Today, Christianity is often seen today to be a nice, pleasant ride on a railroad car as the countryside passes by, rather than a strenuous, dusty walk along a narrow trail. Gone today is the talk of tribulation and distress and hardships. Here today is the talk of blessings and benefits and ease. Yet, Jesus said, “The gate is small, and the way is narrow that leads to life, and few are those who find it” (Matthew 7:14). Let us walk the path and not take the train. I host an after-school program for children in the neighborhood of our church twice a week. We call it, “Kids KLUB,” which stands for Kids Learning and Understanding the Bible. 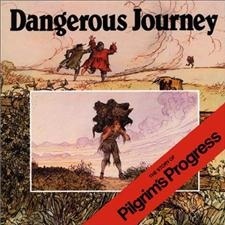 We just finished reading The Dangerous Journey, which is a shortened version of the story of Pilgrim’s Progress, with lots of fabulous pictures. The kids absolutely loved hearing it read and looking at the pictures. Since we reviewed the story each week, the kids all know about how Christian left the city of Destruction to head to the Celestial City. Evangelist told him to go via the wicket-gate (i.e. the small gate). He left with a burden on his back (representing his sin), which fell off and rolled into the tomb when he looked to the cross. At this point, he was given new clothes (representing the righteousness of Christ). Along the way, he fell into depression in the Slough of Despond. He sought his justification by works when he went off the path to the city of Morality (Evangelist came and pointed him in the right way again). He tried to warn others, like Simple, Sloth, and Presumption of the danger that lay ahead, but they neglected his warning. Along the way, he sought the straight path, though deviating from time to time because of his own sin. He fought Apollyon and walked through the Valley of the Shadow of Death. Along the way, he met two friends who encouraged him in his journey, Faithful and Hopeful. He and Faithful refused the world’s goods in Vanity Fair. He and Hopeful struggled together in Doubting Castle. In the end, they both crossed the River of Death and arrived safely in the Celestial City. It’s a great picture of the struggle of the Christian Life. If you have never read Pilgrim’s Progress, this book would be a great place to start. It would also be great for you to read with your own children. I highly recommend it. 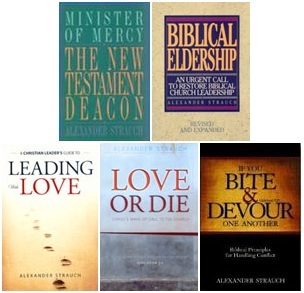 Alexander Strauch has written some excellent books that have served the body of Christ greatly. I have devoured his first two books, Minister of Mercy: The New Testament Deacon (first published in 1992), and Biblical Eldership (first published in 1995). They are great books setting forth the pattern of leadership as found in the New Testament. They help to differentiate between the two offices in the church: Elders and Deacons. Elders are to focus their attention upon shepherding, leading, teaching and guiding the church. Deacons are to focus their attention upon the practical needs of the body and serve to meet them. They have been a great help to how we view leadership at our church. In recent years I have obtained three other titles that Strauch has written: Leading with Love (published in 2006), Love or Die (published in 2008), and If You Bite and Devour One Another (published in 2011). Now, I’m no prophet. Nor do I have special insight into the reasons for the recent emphasis of Strauch’s writings. However, I can make a guess (and if I’m wrong, the point is still valid). My guess is that they flow out of Strauch’s own experiences as it relates to his first two books. Strauch’s books on leadership have become the standard for many churches. As a result, he has surely counseled with many churches concerning leadership in their church. I have personally heard of instances in which he was called to help counsel churches deal with leadership problems. My hunch is that he has seen a lack of love in many churches, which has been the source of their problems, not the structure of leadership (which was the topic of his first two books). Church leaders have done well in defining the roles of the two Biblical offices, but have done poorly in carrying out the heart that is needed in Biblical leadership, which is love. In other words, church leaders get the outside right, but they have missed the inside. That’s my guess on why Strauch has written several books on love. At any rate, my point here is still true: Church leaders need to love those whom God has given them to lead. I just finished reading a fascinating book entitled, unPLANNED. It tells the story of Abby Johnson, who was a former director of a Planned Parenthood clinic in Bryan, Texas, where abortions were regularly performed, but now has joined the Coalition for Life, which fights for the rights of the unborn. I had first heard of the book while praying outside the abortion clinic in Rockford. I finally got my hands on the it this week. The story is compelling. I could hardly put it down. It gives a good insight into the battles that rage across our land at abortion clinics. Outside the fence, you have pro-life protesters, praying and offering help to women who are choosing abortion. Inside the fence, you have pro-choice workers, seeking to assure scared women that abortion is a good thing. 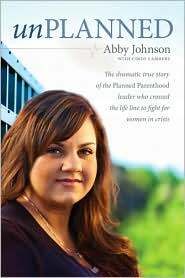 Throughout the book, Abby Johnson’s care and compassion for the welfare of women comes through loud and clear. In fact, her heart for women is why she was working with Planned Parenthood in the first place. They say that their goal is to reduce unwanted pregnancies and abortions. However, over the eight years that she worked for Planned Parenthood, she came to see that since abortions pay the bills, they actually were working to increase abortions in their clinics. Things for Abby came to a head when she witnessed an ultrasound-guided abortion of a thirteen week old fetus. She saw the physicians probe approach the fetus. As it poked and prodded, she witnessed the fetus kick and try to move away from the probing invader. Then, as the suction was turned on, she saw the tiny body violently twisting around and wrung like a dishcloth. Soon, the little body crumpled and was sucked into the tube (pp. 5-6). There are many lessons to be learned from the book. Today, I’ll bring one. Jesus said, “Love your enemies and pray for those who persecute you” (Matthew 5:44). I believe that Abby was won to the other side by the love of her “enemies.” The overwhelming testimony of those who came to pray and to persuade abortion minded women from going through with the procedure was a testimony of love and kindness. The pro-life volunteers (from top to bottom) consistently greeted Abby with grace and offered to help her however they could. When Abby wanted out, she went straight to the Coalition for Life because she knew that they would help her. Abby was impacted several of the pro-lifers personally. People like Mr. Orozco, who was always outside the clinic praying whenever abortions were being performed, was always gracious to her. She said, “He’s so sweet. He never bothers our clients at all, just takes his spot and greets everybody. … He must be in his seventies, but not matter what the weather, he’s out there, friendly as can be” (p. 52). I’m praying for you, Abby! Abby kept the card for two years and was sure to grab it when she cleaned out her desk for the last time. This note was an expression of love from the pro-lifers to Abby, the arch-enemy of their cause. But, it made an impact. When she quit her job with Planned Parenthood, she desperately wanted to speak with Elizabeth and tell her the news. When Mr. Orozco found out what Abby had done, he embraced her saying, “Oh Abby, I have been praying for you for so many years. It is so good to see you on this side of the fence! What an answer to prayer you are!” Abby comments, “This kind man had been praying for me for years. God had answered his prayers. I had no words sufficient to express my gratitude” (p. 210). Many who are loved and prayed for never turn to the truth. But, this is no reason to stop loving our enemies as Christ called us to do. “The answer to prayer can take a very long time” (p. 246). Twice a year our local library has a book sale. They sell the books that people have donated to the library. They sell them cheap, like 50 cents for a paperback and a dollar for a hardcover. 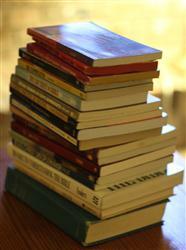 Yesterday, I was able to pick up 18 good books for $10. Most of them will populate my library. Some of them will be given to my children to read (and fill their own libraries). So, watch for your local library book sale. If you look hard, you will be able to find some good, cheap books.